For the first time, Israeli civil rights group Shurat HaDin is suing an Australian academic for his support of movement to boycott Israel. In an unprecedented legal move, Israeli civil rights group Shurat HaDin has filed a lawsuit in Australia's Federal Court against an academic for supporting the Boycott, Divestment, and Sanctions (BDS) movement against Israel, the Australian Broadcast Corporation reports. The suit states that Sydney University professor Jake Lynch's public allegiance to the BDS movement is discriminatory to Israelis and Jews. 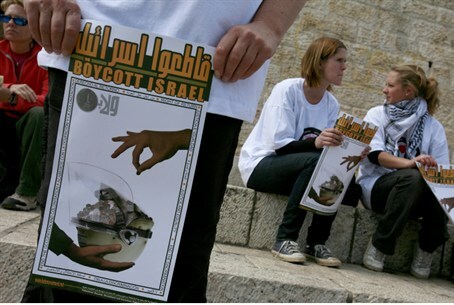 The BDS campaign has gained international publicity for its use of political and economic pressure on Israeli individuals, organizations and companies to protest perceived indiscretions against Palestinian Arabs. BDS is most well-known for its propaganda, and for reports that some of its efforts have turned to violence. Most recently, the Anti-Defamation League (ADL)'s report naming the top 10 most anti-Israel groups used support of the BDS movement as a criterion for an organization to be involved in anti-Israel, anti-Semitic activity. The announcement also comes in the wake of the horrific anti-Semitic hate attack last week where four people where beaten on Shabbat evening while walking through a Sydney suburb. In an interview with Australian news anchor Leigh Sales, Shurat HaDin representative Andrew Hamilton defends the landmark initiative. "BDS is racist and discriminatory by attacking private individuals and organizations based on their racial background or ethnic national background of being Israeli and being Jewish. By attacking them, by depriving them of their human rights, their freedom of expression, that is racist and unlawful." Meanwhile, in response to allegations that the Executive Council of Australian Jewry has declared the move "inappropriate and counterproductive" and that "the most effective means of protest [. . .] is just a publicity campaign", Hamilton points out that Australia's anti-hate Racial Discrimination Act was designed to "protect individuals and organisations from discrimination, from boycotts, from divestment, from sanctions based on their national ethnic origin" and stresses that while legitimate means of free speech like the Israeli media, "which criticizes Israel's policies every single day" is acceptable, "targeting individuals because you dislike the policies of the country where they're from is against the law" and "crosses the line." A representative for Lynch, in an attempt to defend the professor's offensive actions, explained the situation. "My colleague refused to give his signature on the request for approval of a scholarship. There are 3,000 other academics at Sydney University who could and have given those signatures," said Stuart Rees, a fellow professor. He claimed that the objection is not because the scholarship applicant, Hebrew University professor Dan Avnon, is Israeli, but rather "because the campus is on occupied land." Hamilton responded by pointing out the diversity intrinsic in Hebrew University's philosophy, as a place where "Arabs and Jews and Christians and Muslims all learn together," and by reiterating the fact that BDS discriminates against "Israelis and Jews, because that is the critical link" which binds every BDS campaign together. Hebrew University has not yet released a public statement confirming the incident.